Includes models H-1000-A and H-1000-D in Good Condition -case has a little overspray on the exterior. Compact and easy to use design. Holds the maximum reading until reset by pressing the button at the top of gauge. The max-hold feature and small dial size make the H-1000 a good choice for hard to reach places, or for out of sight testing. 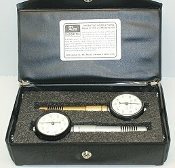 Made by Rex Gauge Company, Div. of Schultes Precision Mfg.